Walking around Conil is relaxing, but since the town is on a hill that gently slopes down to the sea, it’s recommended to start the ascent from the sea at the Paseo Maritime which climbs gently until you reach the town centre. There are many lively bars, terraces and cafés, sometimes with live performances, in the Bateles neighbourhood. The dishes of Conil are among the tastiest in the province and the local restaurants are busy until late, often in historic buildings which have a special atmosphere in their central patios. One of the particular attractions of the area is the ten miles of beautiful beaches. Look out for Castilnovo, Los Bateles, La Fontanilla, El Roqueo, Fuente del Gallo and Roche. And don’t miss the inlets and coves surrounded by wind protecting woods with curious names, such as: Camacho, El Dudario, Los Pitones, Melchor, Del Aceite, del Tio Juan de Medina, del Pator, El Frailecilo, El Aspero, and Encendida. This white hamlet that until a few decades ago housed only fishing and agricultural families and catered for a handful of tourists is today one of the most popular tourist investment places in the whole of the Cadiz province. 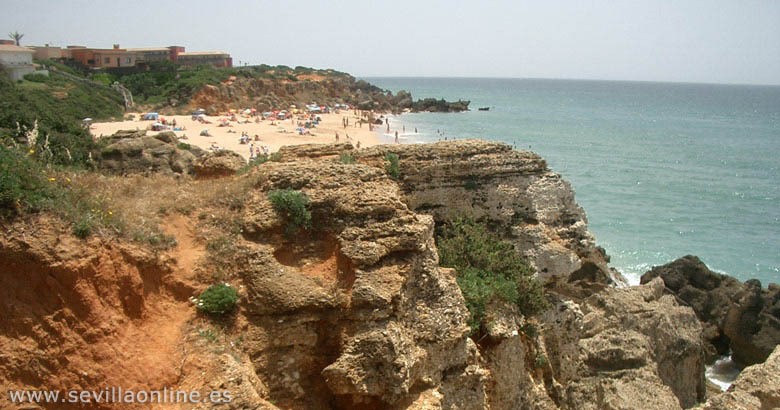 The countryside of Conil de la Frontera is a nice mixture of beaches, woods, pine forests (Roche and Colorado) and coastal thickets intersperced by hillocks and hills that, in some places, lead to cliffs at the sea’s edge.